Everyone’s wished they had a superhuman ability at some point in their lives. 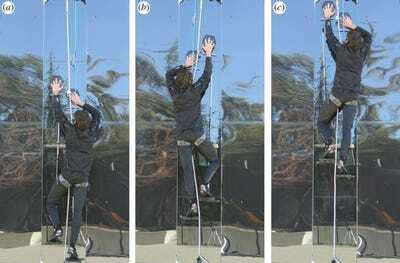 And on the super power scale, the ability to scale glass walls like Spider-Man is right up there at the top — and it’s already possible, as shown by a new invention described in a recently published study in the journal Interface. “This is one of the most exciting things I’ve seen in years,” Kellar Autumn, a biomechanist at Lewis & Clark College in Portland, Oregon, who wasn’t involved with the study, told Science Magazine. To build the devices that enable this wall crawling ability, researchers analysed how geckos support themselves and then improved on that already-powerful adhesive ability. 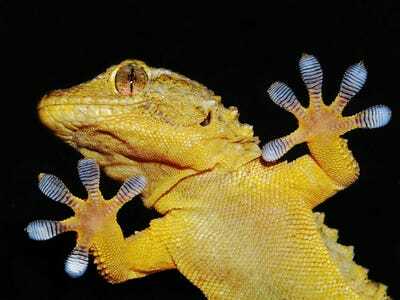 Shutterstoc/nico99Tiny little bristles create an electric force that helps geckos cling to surfaces. But as Science explains, geckos can actually only lift a maximum of 4.4 pounds: The bristles on their feet can’t all be used at the same time. The physical structure of the foot means that only a few small hairs can be at their stickiest at once. So on a small scale, they are incredibly powerful, but it’s hard to scale up that ability to bigger and heavier objects. Whenever humans have tried to replicate gecko climbing ability, they have run into the same problem — they can’t replicate sticking power using only a tiny surface area, and it’s especially difficult to create enough sticking power for something as large as a person. E. Hawkes et al.Moveable footholds are attached to the pads, so the body weight of the climber is being supported by the adhesive pad against the wall, not by brute arm strength. In the new contraption, the two hand pads are all that hold the climber (lead study author Elliot Hawkes in the image above) in the above photo. The footholds he stands on are connected to those hand pads, so that the pads themselves are holding his body weight and he doesn’t have to cling to the wall using brute strength. He’s actually just standing on the foot-ledges in the above image. Each of the two hand pads is covered by 24 small tiles. Each tile is covered in tiny silicon rubber hairs that mimic the gecko’s setae, each about as tall as human hair is thick. Those little rubber hairs, or microwedges, as they are called, can attach and detach easily without breaking down — and there’s something special about their adhesive force that makes them perfect for climbing. Stanford/YouTubeHe isn’t moving fast here and is attached to safety ropes, but once you realise that the only thing holding Hawkes to the wall here are the two adhesive pads in his hands, both of which can be removed and re-attached at will, you realise how impressive this development really is. In order to create pads that are small but still able to use that force to hold a person’s weight, Hawkes had to figure out where the gecko and other attempts at replicating it were inefficient. “Engineers hate inefficient things,” he tells LiveScience. The key was designing the hand pads so that the 24 tiles would be able to fully attach to the wall even with a weight pulling on them. So he connected the tiles using a material that becomes less stiff and more elastic when it’s being pulled on, the opposite of most natural fibres. This means that the pads can evenly distribute all the weight, instead of having the majority of the force pull on one gradually weakening connection. “To be able to climb glass felt a little bit magical — it feels like you’re hooking this device onto a perfectly flat smooth surface, and it doesn’t feel possible,” Hawkes told LiveScience. There are still limitations. This particular version attaches easily to glass, but wouldn’t work the same on a rougher or sandy surface. But he thinks that those problems can be solved using other types of bio-inspired design, like the mechanism that geckos use to self-clean their setae as they go. But we’re hoping he also takes a shot at harnessing the power of the spiderweb.